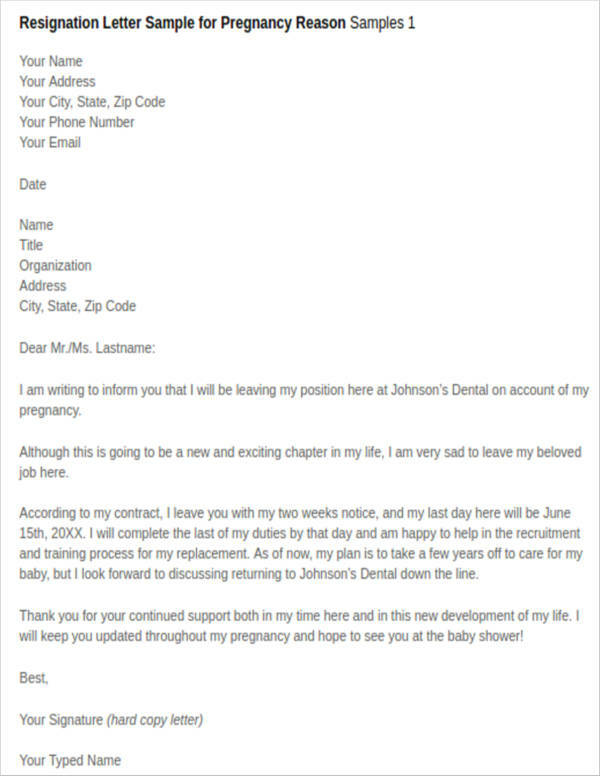 If you are thinking about quitting your job due to your pregnancy, then we are here to give you a few tips and guidelines on how you can write a pregnancy resignation letter that contains enough detail that would be able to let your employee know about why you need to quit your job. Besides, this is not an odd or unique circumstance. A lot of pregnant women do decide to quit their job, which means that what you are dealing with right now is definitely normal and okay. 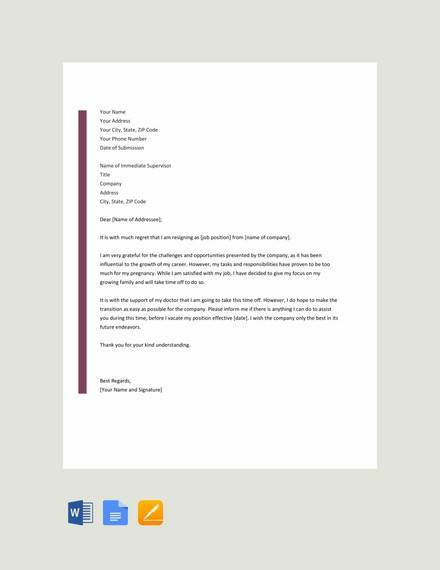 We also have included a few sample resignation letters that you can use as reference for when you start drafting your very own letter. We hope you enjoy reading this article and everything that we will be sharing with you. First things first, there are a few things that you need to think about before you decide to turn in your official resignation letter. One of the things that you need to think about is being able to review the company’s policies and the contract. Ensure that you fully understand the policies well enough and that you know how to go about your resignation. In case there are a few items that you do not understand, you may talk to your HR manager about this to clarify such matters. 1. 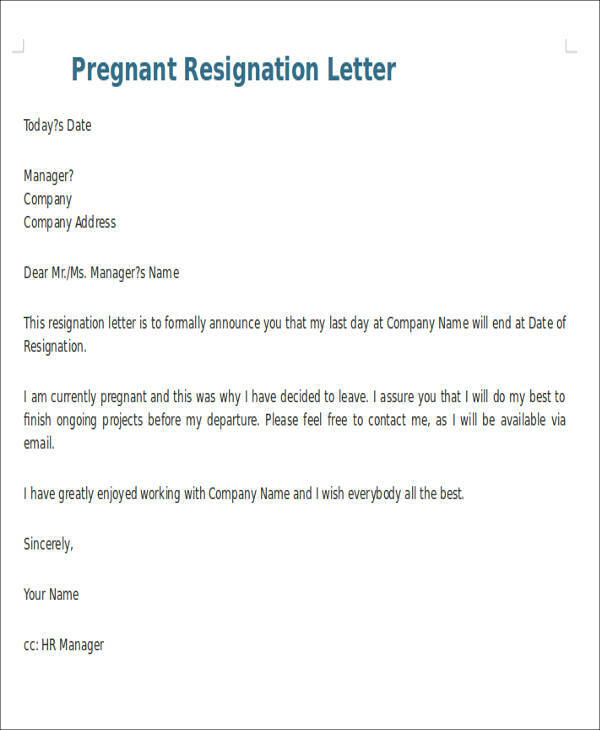 A pregnant woman may decide to resign due to medical reasons as advised by their doctor. 2. 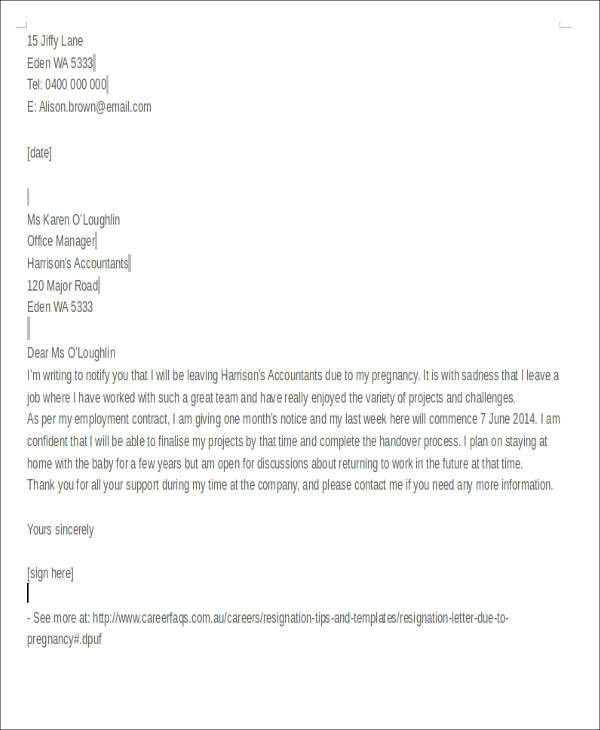 The pregnant woman might need to rest due to muscle or bone problems that would deem her immobile from doing her job properly.You may also see one day resignation letters. 3. The pregnant woman might want to decide due to vitamin deficiency that could affect the development of the unborn child. This could be addressed with proper rest and proper intake of supplements.You may also see manager resignation letters. 1. 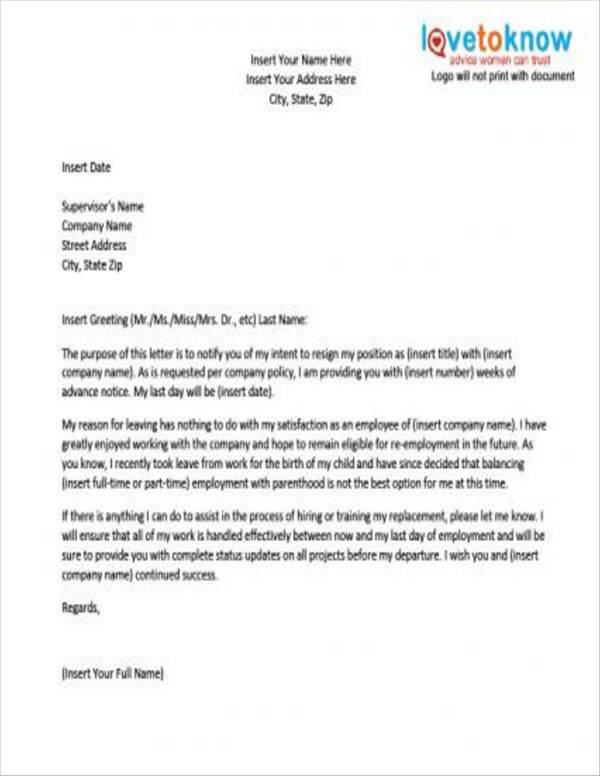 Your letter should start with a formal heading. Make sure that you make use of a formal salutation. 4. If your doctor has provided you a medical certificate, make sure that you attach this, as well as other documents that could make your letter a whole lot more solid and factual. 5. State the date when you would want your resignation to take effect. 8. You may also want to pattern your letter to immediate resignation letters and resignation letter for family reasons. 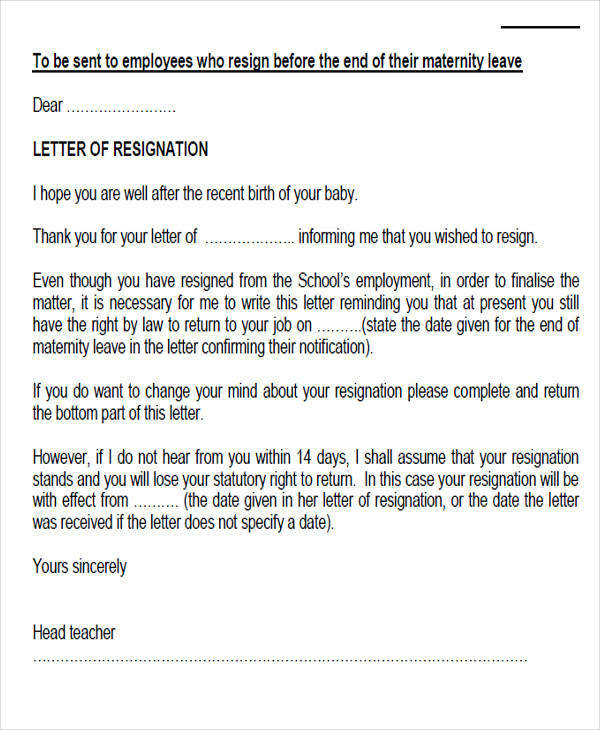 You can have access to templates of these resignation letter types by clicking on the link. Being a full-time mother may not be your choice or maybe something you may not be thinking about while you are still pregnant. However, once you see your baby and get to hold him/her in your arms, you may want to be a hands-on type of mom and decide now that you want to be the one who will do all the things that your baby would need. This is when you would probably start thinking about writing the resignation letter. 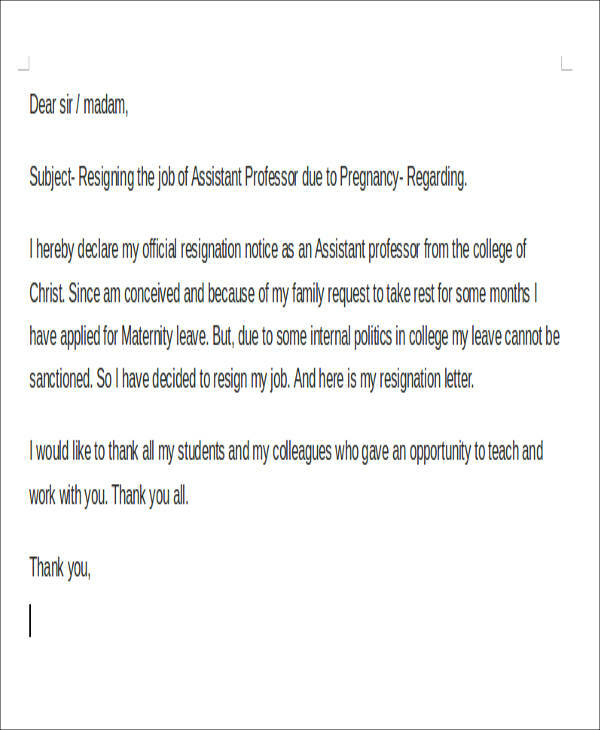 Handle this situation carefully and check out the tips for resignation letter that we would share in order for you to keep and maintain a positive and professional relationship with your employer. Here’s what we want you to know. 1. Make sure that you carefully assess all the options that is presented to you. 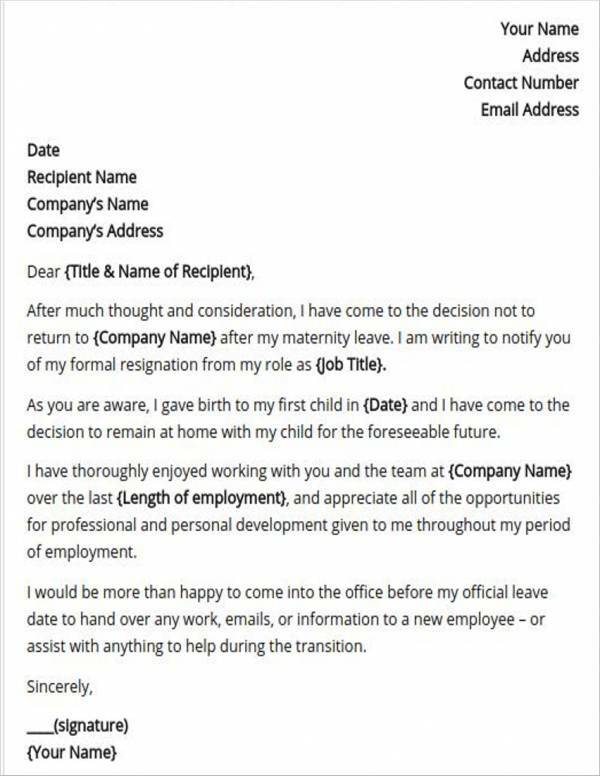 Ensure that the options provided do not give or allow you to return to your job to achieve a work-life balance while being a mom to your newborn child. 2. Arrange to meet with your boss face-to-face before you decide to hand in your resignation letter to him/her. 5. Let your employer know that you will miss being in the office, that you will miss your colleagues, and that you will miss your work. Keeping in touch with your former employer is a good way of keeping them in your network. Plus, it makes it less awkward to ask for employer recommendation letters, which will be greatly useful once you start working for your child’s future. Just always remember to keep everything professional and to carefully take every option into consideration. Now that you know how to deal with this, we hope that you will now be able to come up with a good resignation letter. We wish you all the best with motherhood and we also wish you and your child good health. Cheers!